Kareem Abdul-Jabbar practices yoga during a session in 1996. This is the fourth in the five-part series, 'Getting Healthy in 2016,' in which SI.com's in-house sports scientist Michael J. Joyner will be talking with team doctors, trainers and experts from the world of sports to help our readers learn how they can improve their lives by eating, training and living better. This is the fourth piece in the five-part series, 'Get Healthy in 2016,' in which SI.com's in-house sports scientist Michael J. Joyner will be talking with team doctors, trainers and experts from the world of sports to help our readers learn how they can improve their lives by eating, training and living better. For parts 1, 2 & 3 visit si.com/edge. The last three columns have dealt with how to make your fitness resolutions work, by eating better, starting a workout program and still being active without a formal work out plan. So let’s assume you have been sticking with it for the last six weeks and making steady progress towards your goals but it is just getting to be a drag or a grind or just plain tough to keep pushing. How to get out of that mental trap? For starters, you are not alone. One of my favorite quotes comes from the legendary Vince Lombardi who simply said “fatigue makes cowards of us all.” So we all experience physical fatigue, but mental fatigue can be equally challenging. Sometimes the best thing to do is push through things. However, a lot of times the wise thing to do is step back and give yourself a break to regroup. Here are some thoughts about how to make that happen.
. The idea is essentially an extended 30-minute warm up and stretching to get the blood flowing. Many times a couple of days of active rest are all that is needed to get back on track. One of the problems with monitors, trainers, and apps is that you can get into a cycle of pushing yourself every day to do more. A good rule of thumb is that most people can only sustain five or six really hard sessions every two weeks. Be a minimalist when you can. This means cutting distractions out of your life. We all live in a hyper world with a lot of moving parts. What can you simplify? What can you stop doing? Are there decisions you don’t have to make? In my own case I have the same smoothie almost every day for breakfast. It includes blueberries, nuts, flaxseed meal, whey protein, cocoa, and milk. The smoothie is based in part on the portfolio diet plan and lets me get a quick, no-decision, healthy breakfast that sticks with me after my morning workout, which also aids recovery. It is also just one less thing to think about. Take a diet holiday, or let yourself cheat once in a while. This is a complex topic and the science behind it is not rock solid, but no one is perfect and there is evidence that a splurge now and again can actually help you lose weight and keep it off in the long run. Just one breath! There is a lot of evidence that mindfulness and meditation can help us rewire our brains, but meditation like a diet and exercise plan can also be just one more thing to do and another way to further clutter up an over-scheduled and over-planned day. That is why I like the “just one breath” approach. I first read about this in something written by the famous poet Gary Snyder. The idea is that when the world is closing in on you to take a moment and just do one breath and try to reset your perspective. In most cases the world is not coming to an end and with a little bit of focus and relaxation it is possible to work your way out of many temporarily stressful situations. 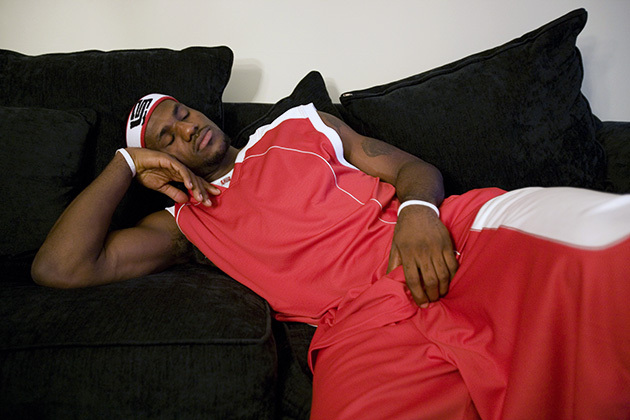 LeBron James takes a quick nap between takes at commercial shoot for Nike in August 2005.
. Earlier this year I loaned my copy to med-student who was struggling with test anxiety and the result was an A. Sleep your way to weight loss and fitness. When you are sleep deprived the first thing that suffers is self-discipline and motivation. It is easier to reach for a bag of chips than go to the gym. Sleep deprivation also makes recovery from exercise more difficult. I know you are busy, but if you can’t take care of yourself by doing things like getting enough sleep, how can you take care of the rest of your world? So when the doldrums, burnout, lack of motivation, and life in general catches up to you—know the enemy and calibrate your responses. Usually with a bit of active rest, more sleep, some permission not to be perfect and a few deep breaths you can beat back all sorts of things. Success in fitness and weight loss does not require you to be perfect every day, but it does require you to do something almost every day and sometimes less is more.